Until the end of December 2017. I read it that you'll need to use £2.50 voucher and £10 of your hard earned cash to get into London Eye not that they would give you £10 cash and admission ? So you use £10 cash and £2.50 in clubcard vouchers for the ticket? Not used it myself as no plans to travel to London this month but it seems like you get £10 cash.. can someone confirm it please? Hi Sammy178, you use £2.50 of clubcard vouchers, then you receive an email with a code and link to London Eye website. This code then lets you purchase a ticket for the London Eye at a cost of £10. The £2.50 voucher is automatically redeemed during this process. Its all quite easy with good instructions on how to do it at each step of the process. So overall cost for each ticket is £2.50 in clubcard vouchers and then £10 of your own money. Or better if you are two and travel by train then use daysoutguide.co.uk/lon…eye Even if you don't travel by train to London just buy a cheap single train ticket at London Train Stations (Not tube station) with national rail logo and get 2 for 1. This is great deal but the title should be changed. So is the 2 for 1 better than this deal ? The Tesco web page states " Turn your vouchers into savings with The Coca-Cola London Eye admission + £10 cash" but |i fail to see where anyone receives "£10 cash". Very misleading. 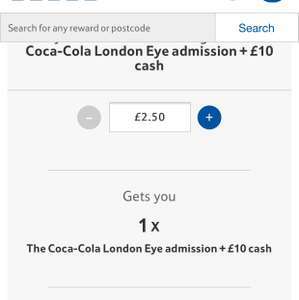 The Tesco web page states " …The Tesco web page states " Turn your vouchers into savings with The Coca-Cola London Eye admission + £10 cash" but |i fail to see where anyone receives "£10 cash". Very misleading. You don’t you use £2.50 in clubcard vouchers to get an email which give code and booking information to redeem it for a ticket by paying £10. Tesco website and this post title are both misleading. Perhaps people can update if they've managed to get the tickets and cash honoured? Maybe i'm missing a trick. 3. You will be prompted to enter the number of Tesco Clubcard 1 Day Tickets that you wish to purchase. Please note that a unique special offer token code is required for each Tesco Clubcard 1 Day Ticket. 4. Enter your unique special offer code(s) on the following page, and then select the date and time when you wish to visit the attraction – please ensure you select the correct date and time that you are able to visit on as you will be asked to arrive at the attraction within your designated time slot. You can book for visits upto and including 30th December 2017. 5. Click ‘Checkout' to complete your purchase and pay the £10.00 per ticket purchased, or ‘Continue Shopping' to add additional ticket products to your shopping basket. Please note, ayment can only be made through this website and by appropriate debit or credit card. 6. Once payment has been accepted, you will receive an email from the Coca-Cola London Eye containing your print at home ticket. You must print this out and present it at the attraction entrance. Please do not queue at the payment kiosks. If you have ordered more than one ticket you will need to print each one out." Plus the price of the cheapest single ticket(s). Save your cash and visit the rooftop garden in the Walkie Talkie building or the outdoor viewing gallery in the new Tate Modern building. Title needs changing. Very misleading. Hi...sorry...just changed the title. Was away.